Ram Viswanathan: Have a Question for Chinmayi ? Have a Question for Chinmayi ? Chinmayi is the next guest in my Podcast interview series. Chinmayi needs no introduction to folks who have following Tamil Films. She came on to the scene with a bang and was introduced by some big guns of the Indian movie industry. She sang "Oru Theivam Thantha Poove" for AR Rahman in Manirathnam's Kannathil Muthamittal which was a runaway success. Since then she has sung in numerous films in Tamil and in other languages. 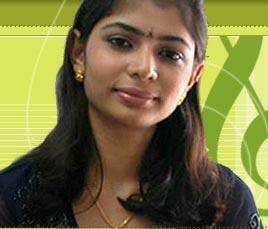 Currently, Chinmayi is also hosting the Airtel's Super Singer show in Vijay TV. This popular talent hunt show has been on the air for several weeks now and might run for few more weeks. We are now left with 8 contestants and one of them will get an opportunity to sing for Harris Jayaraj. Besides singing and hosting, Chinmayi also runs a translation company called Blue Elephant. I planned to talk to her about her singing, hosting and her translation company. Do you have question for her ? Forest Gump is her favorite movie? Question - Do you watch this movie repeatedly and how do you like to emulate his example to our Indian culture? Men are from Mars and Women are from Venus is one of her favorite book? Question - Is she planning to use this in her married life? Yes.. It was a typo.. fixed it.. thanks.. Fantastic Video Visu. Did you record it in Jaya TV and post it? Chinmayi ( sorry chinmayi)..looks a little older in the Video clip..but boy..what a song.! Whenever..I listen to it..I get goosebumps! 1) How does she find time. 2) Does she face any problems due to blogging? since she is a celeb. 3) How does she feel about singing a classic like Oru deivam thandha..vs. a dappangutthu? 4) Who is her favorite lyricist? Most upcoming singers & (established singers) don't really bother about the quality of lyrics before they sign up to sing a song. This trend is more common among kuthu song singers like Srilekha Parthasarathy, Malathi and Anuradha Sriram. what is her take on his and does she say no to songs if the lyrics are vulgar / tasteless. Glad you liked the Video..
Ram - Here are my questions. 1. Why did you choose singing as your profession ? 2. How does one become a playback singer ? 4. Pick 3 songs that you would've loved to sing from the 70s. why ? 5. Can you please walk us through a typical recording session. Who does what ?. What happens when ?, things like that. 6. Is there something called bad music ? 7. What was the most valuable advice/tips/suggestion you had from someone, which had a significant impact on your singing. 8. Which was your the first favourite film song ?. Can you please sing a few lines from that ?. 9. What is your favourite instrument ?. Why ?